Ett digitalt ljudmixersystem med många användningsområden som Radio, TV, ENG, DSNG, konferensanläggningar, kyrkor, restauranger, köpcentrum, etc. The Studer Micro Series is a compact and cost-effective digital audio mixing system that provides the features and functionality of a high-end mixing system. By combining renowned Studer quality with powerful features including AoIP, Lexicon effects processing, VoiceMix automatic mixing and more, the Studer Micro Series delivers unprecedented value for a variety of applications. 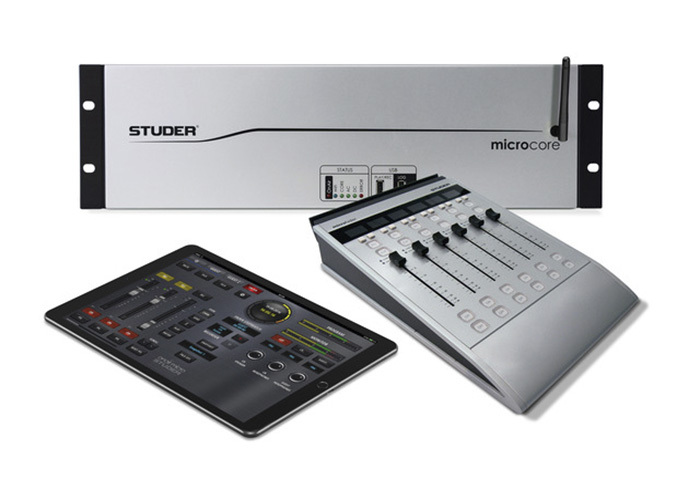 Comprised of the core unit, graphical user interface and optional fader control surface, the Studer Micro Series is ideal for radio and TV broadcast, production studios, ENG/DSNG and more. With full control from any standard web browser or tablet, the Studer Micro Series provides everything you need for your facility in one box. At the center of Studer Micro Series is the core unit—a rugged 3RU, fanless rack-mountable chassis with integrated I/O, DSP and a control system that’s hosted by an internal web server. Unlike other broadcast solutions that require expensive add-ons, the core features AoIP as standard with eight channels of DANTE I/O. The core can be controlled using the intuitive GUI via web browser, or with the optional fader control surface. The powerful feature set and flexible control architecture of the Studer Micro Series is ideally suited for “live-to-air” or “off-air” production environments, as well as remote broadcast, corporate, hospitality sound reinforcement and more. Every function of the core unit can be controlled via the intuitive graphical user interface (GUI). Simply open the web browser on your computer or tablet using LAN or Wi-Fi, enter the IP address of the core, and the GUI appears—no need to install any software. A single device can control multiple core units, and conversely, multiple devices can control a single core simultaneously. The web-based Studer Micro Series GUI allows you to move freely anywhere in the mix environment. Surfaces are represented graphically, allowing a potentially large surface to be displayed on a small screen. This represents a huge cost-saving opportunity by practically eliminating the need for a large, expensive control surface. Many live broadcasters appreciate the touch of physical faders—tactile controls are essential for quick level adjustments and seamless multi-tasking, allowing the operator to work the system by touch alone. The fader unit is a highly simplified 6-fader surface that offers streamlined controls for live operation. Two controllers can be attached to a single core for a maximum surface size of 12 faders. The Studer Micro Series elevates your facility with industry-leading innovation and renowned Studer quality. The core unit features the same high-quality inputs as our acclaimed Studer Vista 1 and OnAir 1500 mixing consoles, as well as the Compact Stagebox I/O frame. Eight AoIP DANTE I/O connections, two stereo Lexicon effects processing engines, and an integrated stereo Track Player/Recorder all come standard. And our proprietary VoiceMix algorithm alleviates high-pressure broadcast situations by automatically mixing and processing up to 12 inputs.